Ferdinand I (12 January 1751 – 4 January 1825), was the King of the Two Sicilies from 1816, after his restoration following victory in the Napoleonic Wars. Before that he had been, since 1759, Ferdinand IV of the Kingdom of Naples and Ferdinand III of the Kingdom of Sicily. He was also King of Gozo. He was deposed twice from the throne of Naples: once by the revolutionary Parthenopean Republic for six months in 1799 and again by Napoleon Bonaparte in 1805. Ferdinand was the third son of King Charles VII of Naples and V of Sicily by his wife, Maria Amalia of Saxony. On 10 August 1759, Charles succeeded his elder brother, Ferdinand VI, becoming King Charles III of Spain, but treaty provisions made him ineligible to hold all three crowns. On 6 October, he abdicated his Neapolitan and Sicilian titles in favour of his third son, because his eldest son Philip had been excluded from succession due to illnesses and his second son Charles was heir to the Spanish throne. Ferdinand was the founder of the cadet House of Bourbon-Two Sicilies. Ferdinand was styled both Ferdinand III of Sicily (6 October 1759 – 12 December 1816) and Ferdinand IV of Naples (6 October 1759 – 23 January 1799; 13 June 1799 – 30 March 1806; 22 May 1815 – 12 December 1816). On 21 January 1799, the Kingdom of Naples was abolished and replaced by the Parthenopaean Republic which lasted until 13 June 1799. Ferdinand was restored to the throne for a while. On 26 December 1805, Napoleon I of France declared Ferdinand deposed again and replaced him with his own brother Joseph Bonaparte on 30 March 1806. Ferdinand was restored for the second time following the Austrian victory at the Battle of Tolentino (3 March 1815) over rival monarch King Joachim I. On 8 March 1816 he merged the thrones of Sicily and Naples into the throne of the Two Sicilies. He continued to rule until his death on 4 January 1825. 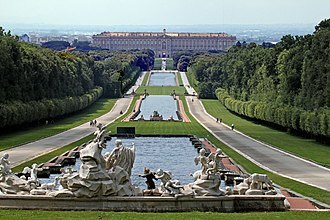 Ferdinand was born in Naples and grew up amidst many of the monuments erected there by his father which can be seen today; the Palaces of Portici, Caserta and Capodimonte. 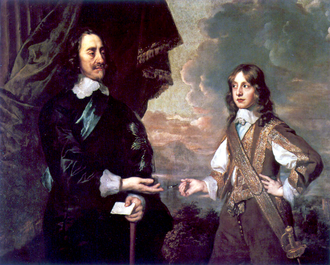 Ferdinand was his parents' third son, his elder brother Charles was expected to inherit Naples and Sicily. When his father ascended the Spanish throne in 1759 he abdicated Naples in Ferdinand's favor in accordance with the treaties forbidding the union of the two crowns. A regency council presided over by the Tuscan Bernardo Tanucci was set up. The latter, an able, ambitious man, wishing to keep the government as much as possible in his own hands, purposely neglected the young king's education, and encouraged him in his love of pleasure, his idleness and his excessive devotion to outdoor sports. Ferdinand's minority ended in 1767, and his first act was the expulsion of the Jesuits. The following year he married Archduchess Maria Carolina, daughter of Empress Maria Theresa. By the marriage contract the queen was to have a voice in the council of state after the birth of her first son, and she was not slow to avail herself of this means of political influence. Tanucci, who attempted to thwart her, was dismissed in 1777. 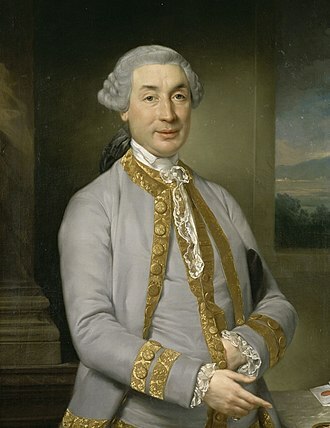 The Englishman Sir John Acton, who in 1779 was appointed director of marine, won Maria Carolina's favour by supporting her scheme to free Naples from Spanish influence, securing rapprochement with Austria and Great Britain. He became practically and afterward actually prime minister. Although not a mere grasping adventurer, he was largely responsible for reducing the internal administration of the country to a system of espionage, corruption and cruelty. Although peace was made with France in 1796, the demands of the French Directory, whose troops occupied Rome, alarmed the king once more, and at his wife's instigation he took advantage of Napoleon's absence in Egypt and of Nelson's victories to go to war. He marched with his army against the French and entered Rome (29 November), but on the defeat of some of his columns he hurried back to Naples, and on the approach of the French, fled on 23 December 1798 aboard Nelson's ship HMS Vanguard to Palermo, Sicily, leaving his capital in a state of anarchy. The French entered the city in spite of the fierce resistance of the lazzaroni, and with the aid of the nobles and bourgeoisie established the Parthenopaean Republic (January 1799). When, a few weeks later the French troops were recalled to northern Italy, Ferdinand sent a hastily assembled force, under Cardinal Ruffo, to reconquer the mainland kingdom. Ruffo, with the support of British artillery, the Church, and the pro-Bourbon aristocracy, succeeded, reaching Naples in May 1800, and the Parthenopaean Republic collapsed. After some months King Ferdinand returned to the throne. The king, and above all the queen, were particularly anxious that no mercy should be shown to the rebels, and Maria Carolina (a sister of the executed Antoinette) made use of Lady Hamilton, Nelson's mistress, to induce Nelson to carry out her vengeance. The king returned to Naples soon afterwards, and ordered a few hundred who had collaborated with the French executed. This stopped only when the French successes forced him to agree to a treaty which included amnesty for members of the French party. 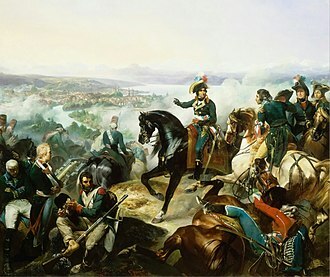 When war broke out between France and Austria in 1805, Ferdinand signed a treaty of neutrality with the former, but a few days later he allied himself with Austria and allowed an Anglo-Russian force to land at Naples (see Third Coalition). Piastra of Ferdinand IV of Naples, dated 1805. 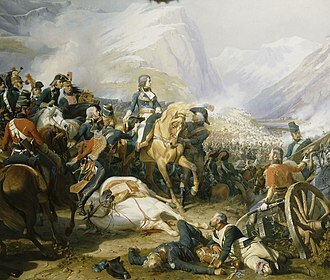 The French victory at the Battle of Austerlitz on 2 December enabled Napoleon to dispatch an army to southern Italy. Ferdinand fled to Palermo (23 January 1806), followed soon after by his wife and son, and on 14 February 1806 the French again entered Naples. Napoleon declared that the Bourbon dynasty had forfeited the crown, and proclaimed his brother Joseph King of Naples and Sicily. But Ferdinand continued to reign over the latter kingdom (becoming the first King of Sicily in centuries to actually reside there) under British protection. Parliamentary institutions of a feudal type had long existed in the island, and Lord William Bentinck, the British minister, insisted on a reform of the constitution on English and French lines. The king indeed practically abdicated his power, appointing his son Francis as regent, and the queen, at Bentinck's insistence, was exiled to Austria, where she died in 1814. After the fall of Napoleon, Joachim Murat, who had succeeded Joseph Bonaparte as king of Naples in 1808, was dethroned in the Neapolitan War, and Ferdinand returned to Naples. By a secret treaty he had bound himself not to advance further in a constitutional direction than Austria should at any time approve; but, though on the whole he acted in accordance with Metternich's policy of preserving the status quo, and maintained with but slight change Murat's laws and administrative system, he took advantage of the situation to abolish the Sicilian constitution, in violation of his oath, and to proclaim the union of the two states into the kingdom of the Two Sicilies (12 December 1816). Ferdinand was now completely subservient to Austria, an Austrian, Count Nugent, being even made commander-in-chief of the army. For the next four years he reigned as an absolute monarch within his domain, granting no constitutional reforms. The suppression of liberal opinion caused an alarming spread of the influence and activity of the secret society of the Carbonari, which in time affected a large part of the army. In July 1820 a military revolt broke out under General Guglielmo Pepe, and Ferdinand was terrorised into signing a constitution on the model of the Spanish Constitution of 1812. On the other hand, a revolt in Sicily, in favour of the recovery of its independence, was suppressed by Neapolitan troops. The success of the military revolution at Naples seriously alarmed the powers of the Holy Alliance, who feared that it might spread to other Italian states and so lead to a general European conflagration. The Troppau Protocol of 1820 was signed by Austria, Prussia and Russia, although an invitation to Ferdinand to attend the adjourned Congress of Laibach (1821) was issued at which he failed to distinguish himself. He had twice sworn to maintain the new constitution but was hardly out of Naples before he repudiated his oaths and, in letters addressed to all the sovereigns of Europe, declared his acts to have been null and void. Metternich had no difficulty in persuading the king to allow an Austrian army to march into Naples "to restore order". The Neapolitans, commanded by General Pepe, made no attempt to defend the difficult defiles of the Abruzzi, and were defeated at Rieti (7 March 1821). 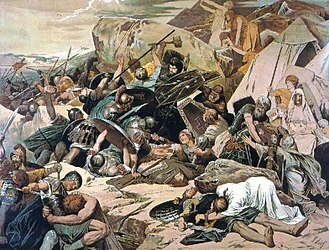 The Austrians entered Naples. Following the Austrian victory, the Parliament was dismissed and Ferdinand suppressed the Liberals and Carbonari. The victory was used by Austria to force its grasp over Naples' domestic and foreign policies. Count Charles-Louis de Ficquelmont was appointed as the Austrian ambassador to Naples, practically administrating the country as well as managing the occupation and strengthening Austrian influence over Neapolitan elites. Ferdinand died in Naples in January 1825. He was the last surviving child of Charles III. 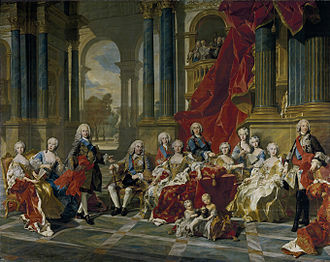 The Royal Family of Naples and Sicily in 1783, Angelica Kauffman; (L-R) Princess Maria Teresa; the future King Prince Francis; King Ferdinand; Queen Maria Carolina holding Princess Maria Cristina; Prince Gennaro (died in 1789); Princess Maria Amalia in the arms of Princess Luisa; the royal couple's seventh child was stillborn during the preparation phase for the painting. The artist then painted a veil over the child already in the cradle, which had been clearly visible in the modello. Maria Teresa Carolina Giuseppina 6 June 1772 13 April 1807 Named after her maternal grand mother Maria Theresa of Austria, she married her first cousin Francis II, Holy Roman Emperor in 1790; had issue. Maria Luisa Amelia Teresa Royal Palace of Naples, 27 July 1773 Hofburg Imperial Palace, 19 September 1802 Married her first cousin Ferdinand III, Grand Duke of Tuscany and had issue. Carlo Tito Francesco Giuseppe Naples, 6 January 1775 17 December 1778 Died of smallpox. Maria Anna Giuseppa Antonietta Francesca Gaetana Teresa 23 November 1775 22 February 1780 Died of smallpox. Francesco Gennaro Giuseppe Saverio Giovanni Battista Naples, 14 August 1777 Naples, 8 November 1830 Married his cousin Archduchess Maria Clementina of Austria in 1797 and had issue; married another cousin Infanta Maria Isabella of Spain in 1802 and had issue; was King of the Two Sicilies from 1825 to 1830. Maria Cristina Teresa Caserta Palace, 17 January 1779 Savona, 11 March 1849 Married Charles Felix of Sardinia in 1807; had no issue; it was she who ordered the excavations of Tusculum. Maria Cristina Amelia Caserta Palace, 17 January 1779 Caserta Palace, 26 February 1783 Twin of the above; died of smallpox. Gennaro Carlo Francesco Naples 12 April 1780 2 January 1789 Died of smallpox. Giuseppe Carlo Gennaro Naples, 18 June 1781 19 February 1783 Died of smallpox. Maria Amelia Teresa Caserta Palace, 26 April 1782 Claremont House, 24 March 1866 Married in 1809 Louis Philippe I, Duke of Orleans, King of the French and had issue. Maria Cristina Caserta Palace, 19 July 1783 Caserta Palace, 19 July 1783 Stillborn. Maria Antonietta Teresa Amelia Giovanna Battista Francesca Gaetana Maria Anna Lucia Caserta Palace, 14 December 1784 Royal Palace of Aranjuez, 21 May 1806 Married her cousin Infante Ferdinand, Prince of Asturias; died from tuberculosis; had no issue. Maria Clotilde Teresa Amelia Antonietta Giovanna Battista Anna Gaetana Polcheria Caserta Palace, 18 February 1786 10 September 1792 Died of smallpox. Maria Enricheta Carmela Naples, 31 July 1787 Naples, 20 September 1792 Died of smallpox. Carlo Gennaro Naples, 26 August 1788 Caserta Palace, 1 February 1789 Died of smallpox. Leopoldo Giovanni Giuseppe Michele of Naples Naples, 2 July 1790 Naples, 10 March 1851 Married his cousin Archduchess Clementina of Austria and had issue. Alberto Lodovico Maria Filipo Gaetano 2 May 1792 Died on board HMS Vanguard, 25 December 1798 Died in childhood (died of exhaustion on board HMS Vanguard). Maria Isabella Naples, 2 December 1793 23 April 1801 Died in childhood. Wikimedia Commons has media related to Ferdinand I of the Two Sicilies. This article incorporates text from a publication now in the public domain: Chisholm, Hugh, ed. (1911). "Ferdinand IV. of Naples" . Encyclopædia Britannica. 10 (11th ed.). Cambridge University Press. pp. 264–265. • 22 May 1815 – 12 December 1816; following Napoleon's final defeat, kept the Crown until its merger with the Crown of Sicily. ^ a b Davis, John (2006). Naples and Napoleon: Southern Italy and the European Revolutions, 1780-1860. Oxford University Press. ISBN 9780198207559. ^ Acton, Harold (1957). The Bourbons of Naples (1731-1825) (2009 ed.). London: Faber and Faber. p. 150. ISBN 9780571249015. ^ Genealogie ascendante jusqu'au quatrieme degre inclusivement de tous les Rois et Princes de maisons souveraines de l'Europe actuellement vivans [Genealogy up to the fourth degree inclusive of all the Kings and Princes of sovereign houses of Europe currently living] (in French). Bourdeaux: Frederic Guillaume Birnstiel. 1768. p. 9. ^ a b c "Le origini dello stemma delle Due Sicilie, Ferdinando IV, poi I". 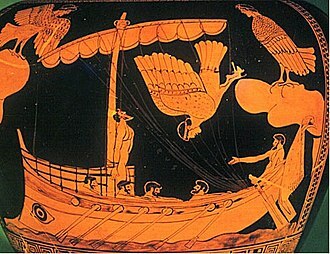 Storia e Documenti (in Italian). Real Casa di Borbone delle Due Sicilie. Archived from the original on 10 April 2013. Retrieved 24 March 2013. The Kingdom of the Two Sicilies was the largest of the states of Italy before the Italian unification. It was formed as a union of the Kingdom of Sicily and the Kingdom of Naples, the Kingdom of the Two Sicilies lasted from 1815 until 1860, when it was annexed by the Kingdom of Sardinia to form the Kingdom of Italy in 1861. The capitals of the Two Sicilies were in Naples and in Palermo, the kingdom extended over the Mezzogiorno and the island of Sicily. Many went to the United States and Argentina, the kingdom was heavily agricultural, like the other Italian states, the church owned 50–65% of the land by 1750. The name Two Sicilies originated from the division of the medieval Kingdom of Sicily, until 1285, the island of Sicily and the Mezzogiorno each formed part of the Kingdom of Sicily. As a result of the War of the Sicilian Vespers, the King of Sicily lost the island of Sicily to the Crown of Aragon, but remained ruler over the peninsular part of the realm. 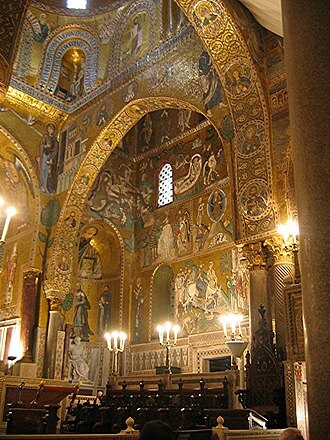 Although his territory became known as the Kingdom of Naples, he and his successors never gave up the title of King of Sicily, at the same time, the Aragonese rulers of the island of Sicily called their realm the Kingdom of Sicily as well. Thus, there were two kingdoms calling themselves Sicily, the Two Sicilies, the Kingdom of the Two Sicilies resulted from the re-unification of the Kingdom of Sicily with the Kingdom of Naples, by King Alfonso V of Aragon in 1442. The two states had functioned as separate realms since the War of the Sicilian Vespers in 1282, in 1501, King Ferdinand II of Aragon, son of John II, conquered Naples and reunified the two kingdoms under the authority of the newly united Spanish throne. The Kings of Spain bore the title King of Both Sicilies or King of Sicily, at the end of that war, the Treaty of Utrecht in 1713 granted Sicily to the Duke of Savoy until the Treaty of Rastatt in 1714 left Naples to the Emperor Charles VI. In 1720 the Emperor and Savoy exchanged Sicily for Sardinia, thus reuniting Naples and Sicily. In 1734, Duke of Parma, son of Philip V of Spain, took the Sicilian crown from the Austrians and became Charles VII & V, giving Parma to his younger brother, Philip. Apart from an interruption under Napoleon, the Kingdom of the Two Sicilies remained under the Bourbon line continually until 1860. Maria Antonia of Naples and Sicily, was the youngest daughter of Ferdinand, King of Naples and Sicily, and Maria Carolina of Austria. As the wife of the future Ferdinand VII of Spain, apparent to the Spanish throne. She was known as Maria Antonia and was born at the Caserta Palace in Caserta, named after her mothers favorite sister, Queen Marie Antoinette of France, she was an intelligent girl, having by the age of seventeen learned several languages. On 6 October 1802, Maria Antonia married Infante Ferdinand in Barcelona, the princess failed to provide the expected heir to the throne, her two pregnancies, in 1804 and 1805, ended in miscarriages. Her mother, Maria Carolina, was highly anti-French after the execution of her sister and she was strongly opposed to the military expansion of the French republic. As Spain became more dominated by Napoleon Bonaparte, there were rumours that Maria Carolina wanted her daughter to poison the Queen of Spain and Manuel Godoy. In spite of all of this campaign of assassination, Maria Antonia managed to gain considerable influence over her husband and created an opposition party against Queen Maria Luisa. 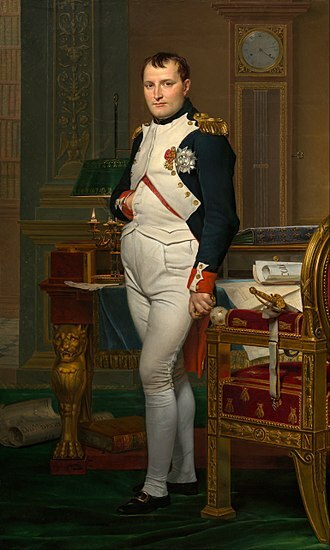 Joseph-Napoléon Bonaparte was a French diplomat and nobleman, the elder brother of Napoleon Bonaparte, who made him King of Naples and Sicily, and King of Spain. After the fall of Napoleon, Joseph styled himself Comte de Survilliers, Joseph was born in 1768 to Carlo Buonaparte and Maria Letizia Ramolino at Corte, the capital of the Corsican Republic. In the year of his birth, Corsica was invaded by France and his father was originally a follower of the Corsican Patriot leader, Pasquale Paoli, but became a supporter of French rule. As a lawyer and diplomat, Joseph served in the Cinq-Cents and was the French ambassador to Rome, in 1795 Joseph was a member of the Council of Ancients, where he used his position to help his brother overthrow the Directory four years later. 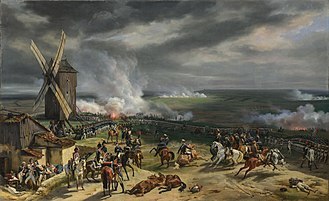 The Château de Villandry had been seized by the French Revolutionary government, in 1806, Joseph was given military command of Naples, and shortly afterward was made king by Napoleon, to be replaced two years by his sisters husband, Joachim Murat. Joseph was made King of Spain in August 1808, soon after the French invasion, Joseph somewhat reluctantly left Naples, where he was popular, and arrived in Spain where he was extremely unpopular. 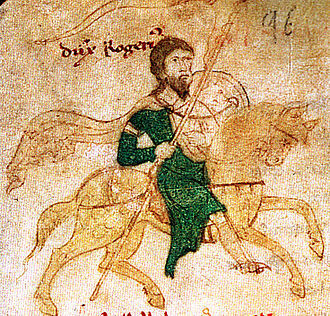 His arrival sparked the legitimate Spanish revolt against French rule, Joseph temporarily retreated with much of the French Army to northern Spain. Joseph and his supporters never established complete control over the country, King Josephs Spanish supporters were called josefinos or afrancesados. During his reign, he ended the Spanish Inquisition, partly because Napoleon was at odds with Pope Pius VII at the time, during Josephs rule of Spain and Venezuela declared independence from Spain. 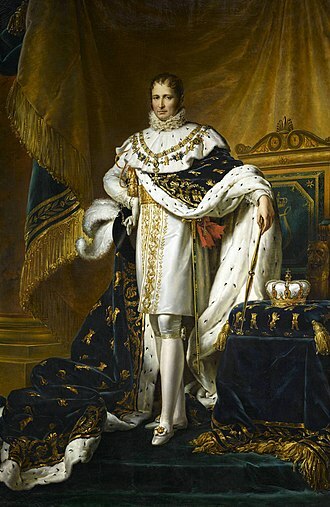 King Joseph abdicated and returned to France after the main French forces were defeated by a British-led coalition at the Battle of Vitoria in 1813. He was seen by Bonapartists as the rightful Emperor of the French after the death of Napoleons own son Napoleon II in 1832, Josephs home was located near the confluence of Crosswicks Creek and the Delaware River. He considerably expanded Sayres home and created extensive gardens in the picturesque style, when his first home was destroyed by fire in January 1820 he converted his stables into a second grand house. At Point Breeze, Joseph entertained many of the leading intellectuals, reputedly some Mexican revolutionaries offered to crown him Emperor of Mexico in 1820, but he declined. Joseph Bonaparte returned to Europe, where he died in Florence, Italy and he married Marie Julie Clary daughter of François Clary on 1 August 1794 in Cuges-les-Pins, France. They had three daughters, Julie Joséphine Bonaparte, zénaïde Laetitia Julie Bonaparte, married, in 1822 to Charles Lucien Bonaparte. Charlotte Napoléone Bonaparte, married, in 1826 to Napoleon Louis Bonaparte and he claimed the two surviving daughters as his heirs. He sired two children with Maria Giulia, the Countess of Atri, Giulio Teresa, Joseph had two American daughters born at Point Breeze, his estate in Bordentown, New Jersey, by his mistress, Annette Savage, Pauline Anne, died young. Maria Anna Angelika Kauffmann RA, usually known in English as Angelica Kauffman, was a Swiss Neoclassical painter who had a successful career in London and Rome. Remembered primarily as a painter, Kauffmann was a skilled portraitist, landscape. She was one of the two founding members of the Royal Academy in London in 1768. Kauffman was born at Chur in Graubünden and her family moved to Morbegno in 1742, Como in Lombardy in 1752 at that time under Austrian rule. In 1757 she accompanied her father to Schwarzenberg in Vorarlberg/Austria where her father was working for the local bishop and her father, Joseph Johann Kauffmann, was a relatively poor man but a skilled Swiss muralist and painter, who was often traveling for his work. He trained Angelica and she worked as his assistant, moving through Switzerland, Angelica, a child prodigy, rapidly acquired several languages from her mother, Cleophea Lutz, including German, Italian and English. She showed talent as a musician and was forced to choose between opera and art and she quickly chose art as a Catholic priest told Kauffman that the opera was a dangerous place filled with seedy people. By her twelfth year she had known as a painter, with bishops. In 1754, her mother died and her decided to move to Milan. Later visits to Italy of long duration followed and she became a member of the Accademia di Belle Arti di Firenze in 1762. In 1763 she visited Rome, returning again in 1764, from Rome she passed to Bologna and Venice, everywhere feted for her talents and charm. Writing from Rome in August 1764 to his friend Franke, Winckelmann refers to her popularity, she was painting his picture. She may be styled beautiful, he adds, and in singing may vie with our best virtuosi, in 1765, her work appeared in England in an exhibition of the Free Society of Artists. She moved to England shortly after and established herself as a leading artist, while in Venice, Kauffman was persuaded by Lady Wentworth, the wife of the British ambassador, to accompany her to London. One of the first pieces she completed in London was a portrait of David Garrick, the rank of Lady Wentworth opened society to her, and she was everywhere well received, the royal family especially showing her great favor. Philip of Naples and Sicily, Duke of Calabria was the eldest son and heir of Charles III of Spain, but was excluded from the succession to the thrones of Spain and Naples due to his imbecility. His younger brothers, Charles IV of Spain and Ferdinand I of the Two Sicilies replaced him in the succession, when his father became King of Spain in 1759, Philip remained in Naples where he lived until his death from smallpox at the age of thirty. Born at the Reggia di Portici in the Kingdom of Naples, he was the child and eldest son of Charles VII and V, King of Naples and Sicily. His birth was an event since his parents previously had five princesses. The Prince was baptized Filippo Antonio Gennaro Pasquale Francesco de Paula and his grandfather, King Philip V of Spain, in whose honor he was named, had died on 9 July 1746. The childs godparents were his uncle and aunt, King Ferdinand VI of Spain. As the heir apparent to his father, he was given the title of Duke of Calabria, although he was born plump and rosy, it was soon evident that there was something wrong with him. His wet nurses had to be changed several times and the child suffered from epileptic fits, as he grew up, it was confirmed that he had disabilities, especially by his peculiar face. According to one observer, the prince suffered from a great heaviness of head, I have been assure that although he is seven years old he does not speak, and that he can scarcely utter a word. However, his parents tried to conceal his deficiencies both from the public and from making the child appear in court ceremonies as if there was nothing wrong with him. Until the age of seven Philip remained with his sisters and younger brothers under the care of a governess, in 1755, he was placed with his brother Charles under the tutorship of the Prince of San Nicandro. 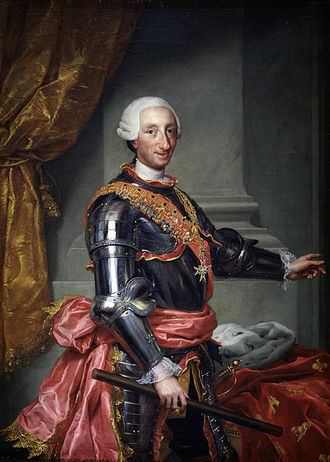 The death of his half-uncle, King Ferdinand VI of Spain, on August 10,1759, since Charles III was to depart to Spain to take possession of the Spanish crown, he had to abdicate the thrones of Naples and Sicily in favour of a son. 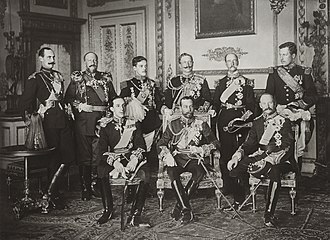 A committee of high officials magistrates and six physicians examined the state of the Prince. Giuseppe of Naples and Sicily was Prince of Naples and Sicily. He died of Smallpox aged two years, Prince Giuseppe was born at the Royal Palace of Naples to King Ferdinand IV of Naples and his Austrian consort Maria Carolina of Austria, daughter of Empress Maria Theresa. A member of the House of Bourbon, he was a Prince of Naples and he was the ninth child of his parents and their fourth son. At the time of his birth, he was third in line to the throne after his brother Prince Francis, Duke of Calabria and his oldest brother Carlo, Duke of Calabria died of smallpox aged 3 and the next in line, Francis became heir apparent. His sisters included the future Holy Roman Empress, Grand Duchess of Tuscany and his younger sisters Princess Maria Cristina, was the wife of the future Charles Felix of Sardinia and Queen of Sardinia, Maria Cristinas twin Princess Maria Cristina Amelia died in 1783 of smallpox. Another sister was the Queen of the French and the youngest was the future Princess of Asturias. Maria Theresa of Naples and Sicily was the last Holy Roman Empress and the first Empress of Austria by marriage to Francis II, Holy Roman Emperor. She was the eldest daughter of Ferdinand IV & III of Naples and Sicily and his wife, Marie Caroline of Austria. Born Maria Teresa, and named after her maternal grandmother Maria Theresa of Austria, she was the eldest of 17 children born to her parents and her father was a son of Charles III of Spain and Princess Maria Amalia of Saxony. Through her mother she was a niece of Marie Antoinette, through her father she was a niece of Maria Luisa of Spain and she was her mothers favourite child from birth until she left the Neapolitan court to marry. Her brothers included the future King Francis and Leopold, Prince of Salerno, Carlo, Duke of Calabria died in 1778 aged 3 of smallpox. Her sisters included Grand Duchess of Tuscany and her younger sister Princess Maria Cristina, was the wife of the future Charles Felix of Sardinia as Queen of Sardinia. Maria Cristinas twin Princess Maria Cristina Amelia died in 1783 of smallpox, another sister was the Queen of the French as the wife of Louis Philippe I and the youngest was the future Princess of Asturias. On 15 September 1790 she married her double first cousin Archduke Francis of Austria, who would become Holy Roman Emperor Francis II, the marriage is described as a happy one, despite differences in personality. Maria Theresa was described as easy-going with a sensuous appearance and she loved masquerades and carnivals, and participated in every ball even while she was pregnant. Vicious tongues accuse her of being so passionate that she exhausts her consort and she is accused of interesting herself in unimportant matters and socializing exclusively with her lady-companions. With them she spends her evenings singing, acting out comedies, in February 1799, her seeming indifference to the revolution against her parents in Naples attracted some disfavour in Vienna. Immediately, the Empress came to him, and he exlaimed, Cant you ever leave me alone. For Gods sake, dont follow me all the time. She did have some influence, as she was interested in politics. An important patron of Viennese music, she commissioned many compositions for official, Joseph Haydn wrote his Te Deum for chorus and orchestra at her request. Maria Carolina of Austria was Queen of Naples and Sicily as the wife of King Ferdinand IV & III. She was a proponent of enlightened absolutism until the advent of the French Revolution, born an Austrian archduchess, the thirteenth child of Empress Maria Theresa and Emperor Francis I, she married Ferdinand as part of an Austrian alliance with Spain, where Ferdinands father was king. 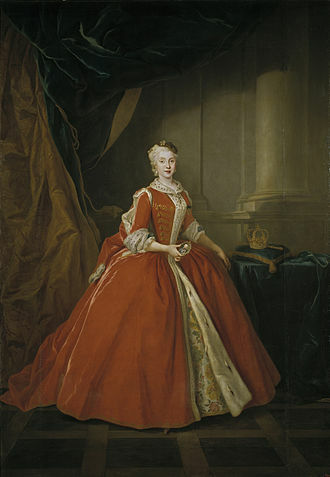 Following the birth of an heir in 1775, Maria Carolina was admitted to the Privy Council. Thereafter, she dominated it until 1812, when she was sent back to Vienna, like her mother, Maria Carolina took pains to make politically advantageous marriages for her children. Maria Carolina promoted Naples as a centre of the arts, patronising painters Jacob Philipp Hackert and Angelica Kauffman and academics Gaetano Filangieri, Domenico Cirillo and Giuseppe Maria Galanti. Maria Carolina, abhorring her sister Marie Antoinettes treatment by the French, allied Naples with Britain and Austria during the Napoleonic, as a result of a failed Neapolitan invasion of French-occupied Rome, she fled to Sicily with her husband in December 1798. One month later, the Parthenopean Republic was declared, which repudiated Bourbon rule in Naples for six months. Deposed as Queen of Naples for a time by French forces, in 1806, Maria Carolina died in Vienna in 1814. Her godparents were King Louis XV of France and his wife, Maria Carolina was the daughter who resembled her mother most. Maria Carolina formed a close bond with her youngest sister. From very early on they shared the same governess Countess Lerchenfeld, a testament to their closeness is the fact that when one caught an illness the other did too. In August 1767 Maria Theresa separated the two girls, hitherto raised together under the auspices of Countess Marie von Brandis, because of their bad behaviour. Soon after in October of the year, Maria Carolinas sister Maria Josepha, destined to marry Ferdinand IV of Naples as part of an alliance with Spain. Anxious to save the Austro-Spanish alliance Charles III of Spain, father of Ferdinand IV, the Empress offered the court of Madrid, negotiating on behalf of that of Naples, Maria Amalia or Maria Carolina. The Sorrow of Telemachus (1783). Oil on canvas by Angelica Kauffman. Self-Portrait Hesitating Between Painting and Music (1794). Oil on canvas by Angelica Kauffman. Maria Theresa with her husband and children. Salon with frescoes with quadratura. Palace of Portici on the right, c 1745. Façade (right) and belltower of Santa Chiara. Princess Maria Cristina, by Louise Élisabeth Vigée Le Brun. Tomb of Philip in Basilica of Santa Chiara. Grand Duchess Luisa by Joseph Dorffmeister, 1797. Maria Isabelle of Naples and Sicily.